Uncivilized Books have a new imprint for younger readers called Odod Books. 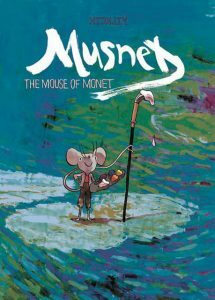 Their first release is a hardcover graphic novel by Kickly called Musnet: The Mouse of Monet. Here’s what they say about it: “A young boy mouse travels the country side looking for work and happens upon the Monet’s garden. He takes on a job and becomes inspired to learn to paint. Will he paint in the classical ways, or in the new style of the impressionist? Which way will his brush sway? Musnet is drawn and painted in a beautiful, lush and inky style popularized by Paul Pope and French comics masters such Blutch and Christophe Blain.” Really. A review in The Guardian goes further into the plot: “This new series revolves around a painting mouse found in Monet’s famous gardens in Giverny: The nameless, orphan mouse is befriended by Mya and her mouse family, who live inside the artist’s house. Introduced to painting after he begins working for Remy, an old squirrel painter, he is enchanted by Monet’s work.” It’s available now at Amazon.